When I was 22 years-old, I was a pall bearer. 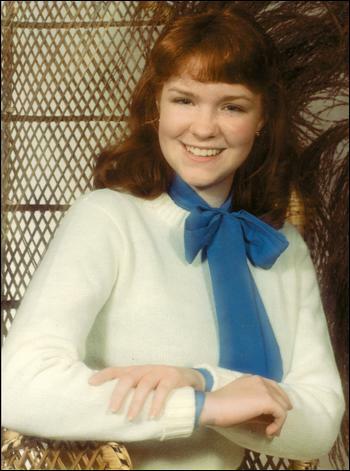 On New Year’s Eve Day in 1985, seven other young men and I lifted the casket that carried our nineteen year-old friend Gina to and from the hearse and then on to the site of her grave in Ashtabula, Ohio. Gina Tenney was the gentlest of souls. Bright red hair. A smile that even now, remembering it more than two decades later, melts my heart. Two days before the funeral, Gina had been found by a trapper checking his traps in the freezing waters of the Mahoning River in Youngstown. She had been raped and strangled. We knew then that the man who lived, at least sometimes, downstairs from Gina — a man named Bennie Adams — was found to have some of her things when they searched his place. As I recall, among them was Gina’s ATM card and her car keys. We also knew he had been bothering her in the weeks leading up to the murder, and Gina changed her phone number to stop the harassing calls he had been making. My friends and I — including Mark, who had been her boyfriend — were pretty certain Adams was the one who had killed her. But the prosecutors said they didn’t have enough evidence to make a murder charge stick. Adams was charged only with possession of stolen property and never went to trial. The grand jury did not even indict him on the stolen goods charge. But the week before last, Adams was convicted of Gina’s murder and sentenced to die by lethal injection next spring. Homicide detectives kept the evidence from the murder for 22 years, including, it turns out, samples from which DNA could later be extracted. Adams spent time in prison for another crime — nearly as heinous as the murder of Gina (he had kidnapped, raped, robbed a school principal) — and was released in 2004. Three years later, he was arrested again, this time for capital murder. in January 1986, we held a memorial service for Gina at Youngstate State University, and I remember Gina’s father telling the local news station that when an animal kills a human being, we put the animal down. That was what he suggested we do with whomever had killed his daughter. The words struck me deeply, and perhaps not in the way you might think. Don’t get me wrong, I was angry as hell and also wanted to see the murderer suffer and die. But I became incredibly uncomfortable with those feelings. I had never wanted to see someone die before. And it was then that I became anti-death penalty. Justice should not be vengeance, I thought. It was feelings of anger, the thirst for vengeance that led to so much bloodshed over the centuries. When I went away to graduate school several months later, the feelings grew stronger as I got involved in Amnesty International. And when I found a young couple who had devoted their marriage as Mennonite volunteers to fight the death penalty in a state (Texas) where it was overwhelmingly favored, I decided to do my graduate documentary thesis project on their cause. I spent a few months following them around. When the verdict and capital punishment for Adams were announced last week, Gina’s father Lucian Tenney reasserted his belief that it is just retribution to put to death the murderer of his daughter. I respect that. And I hope it brings him and his family peace. And I’m trying to get some work done, but I’m distracted by memories of that time. The words of the eulogies. The fake pipes on the wall above the electric church organ. The hymns sung. The inconsolable tears of Gina’s best friend Marvin. The bewilderment in Mark’s eyes. The snow flurries at the graveyard. The tears in the limousine. The chill of the metal handles on the casket as we walked the final steps. In the punishment phase of his trial Mr. Adams’s defense attorneys argued he should be spared from a death sentence because he had bettered himself while serving a previous prison term. But according to an account in the Youngstown Vindicator, the town’s local paper, the judge didn’t buy the argument: “Mr. Adams, you have no remorse, and you have not accepted responsibility for your wrongdoing,” said Judge Timothy E. Franken of Mahoning County Common Pleas Court, who imposed the death sentence Thursday. “Your character is not that of a rehabilitated man,” the judge added. And her spirit lives with all of us who were touched by her kindness and left to cope with her untimely death. When we sat side by side at the trial, the tears still come easily to Marvin’s eyes. The look of bewilderment has faded in mine, replaced by a resignation about how hte world really is. Craig, thought it is painfilled memory, it means a lot to still carry it. Bennie Adams deserves his fate on execution day. Evil needs to be put to rest.